Elegant Avignon’s turn as the seat of papal power bestowed on the city a treasury of magnificent architecture, palaces and grandeur, making it the perfect base for a well-balanced culinary get-away. 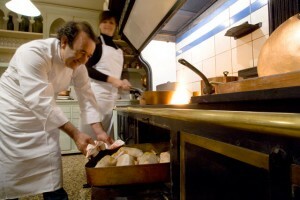 During our culinary tours visit bustling Provencal markets and learn cooking from some of the best chefs of the region. Taste fine Chateauneuf-du-Pape wines – a small vineyard with a big name. Marvel at the massive medieval fortress and UNESCO site Palais des Papes. 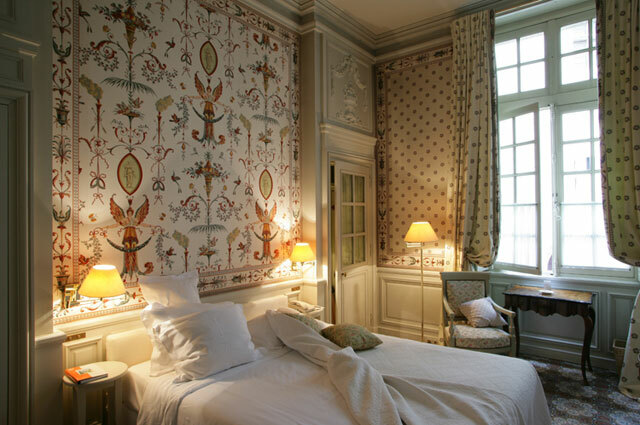 Stay in a beautifully appointed room with exceptional view of the popes’ palace, original tiled floors, silk-lined walls and high ceilings. In the 14th century, Avignon was the capital of Christendom – the popes lived here instead of in Rome. 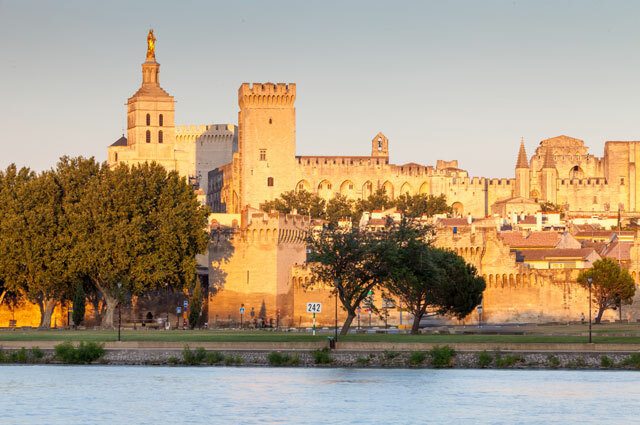 The legacy left by their “court of splendour and magnificence” makes Avignon one of the most interesting and beautiful of Europe’s medieval cities. The popes are long gone, but life goes on exceedingly well. Ringed by incredibly preserved 800-year-old stone ramparts, Avignon is now a lively student city, its ancient cobbled streets lined with inviting boutiques and its leafy squares overflowing with cafe tables. The countryside around Avignon is rich with the best of Provence: lively village markets, medieval towns and Roman ruins, Provence’s best antiques market, scenic cycling and walking trails, the vineyards of Châteauneuf du Pape and the Côtes du Rhône, enormous fields of lavender, and the studios of some of Provence’s best artists and artisans. Make the walled city your base and see all of this and more. 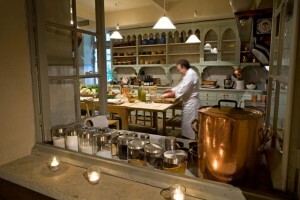 The courses are held in an exceptional 19th century kitchen. 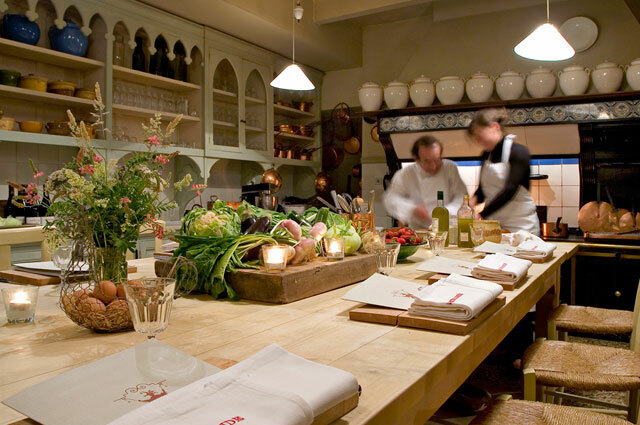 The best chefs in the area are invited to guide you through the recipes of Provençal and French cuisine. 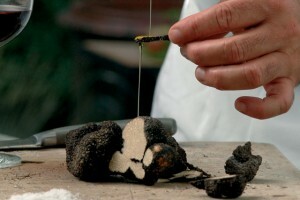 The classes are limited to a maximum of 12 participants working around a huge wood-block table. The kitchen’s original stove is fired up with oak wood three hours before the class begins. Aprons, cooking utensils and translated recipes are provided and there is always someone there to help translate the chef’s commentary if need be. The various dishes prepared are savoured at the end, along with selected wines. Our daily classes are conducted by different chefs for each class on certain weeks throughout the year. Classes are held usually in the mornings and conclude with lunch. During our market-to-table classes, our chefs will guide you to lively Provencal market and show you how to choose the best ingredients. From time to time, we also offer pastry classes in the afternoons. Please enquire about our monthly schedules. Non-cooking partners are welcome to join just the meal at the end of each class. Our privately guided wine tour will take you to Châteauneuf-du-Pape, a medieval village on the side of a hill, guarded by the ruins of an ancient chateau towering above rolling hills of vineyards. Châteauneuf-du-Pape vineyards are farmed organically or biodynamically, and the region’s abundant sunshine and frequent wind (le mistral) practically preclude the need for treating the fields with herbicides or pesticides. The wines themselves are equally pure, their flavours rarely masked by aging in new oak. With more than 8,000 acres under vine, Châteauneuf-du-Pape is the largest appellation in the Rhône, producing only two wines, a red Châteauneuf-du-Pape (which represents 94 percent of the appellation’s production) and a white Châteauneuf-du-Pape. Of the eight red varietals planted, Grenache is the dominant variety, followed by Syrah, Mourvèdre and tiny quantities of Cinsault, Muscardin, Counoise, Vaccarèse and Terret Noir, while the most important white varietals include Grenache Blanc, Clairette, Bourboulenc and Roussanne (Picpoul and Picardin are also permitted). With your expert guide we will be visiting well-known and some exquisite lesser known vineyards with plenty of tastings and cellar access. A chance to sing “sur le pont d’Avignon…”. 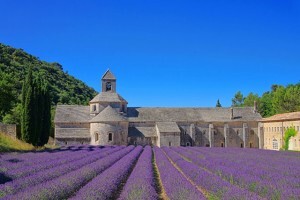 The most beautiful lavender field in the world at the 12th- century Abbey of Sénanque. World-class opera under the stars in the 2,000 year-old Roman amphitheatre at Orange. French country antiques at the bustling Isle-sur-la-Sorgue market every weekend. The 6,000 ft-high summit of Mont Ventoux and the panoramic view from Mont Blanc to Marseille. Exquisite meals at one of the many village markets or Michelin-starred restaurants. Local asparagus and strawberries in April and May; cherries and apricots in June; Cavaillon melon in July; plump fresh figs in August. A warm summer afternoon, a lazy game of boules in the village square under centuries- old plane trees; and a pastis in the local bar. The Roman legacy of the Pont du Gard and the ancient town of Vaison-la-Romaine. The velvet sweetness of a glass of muscat de Beaumes-de-Venise before dinner. A leisurely walk through on the Friday morning farmers’ market in Avignon. A tasting of the finest Châteauneuf-du-Pape wines – a small vineyard with a big name. 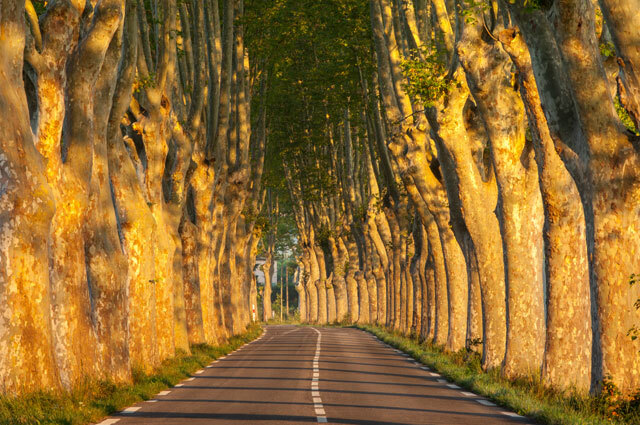 The rich landscapes around St Rémy and the light that inspired Van Gogh and Cézanne. An espresso in the café “Les Deux Garçons” on the Cours Mirabeau in Aix-en-Provence. Wine festivals, lavender festivals, olive festivals, tilleul festivals. The view at sunset of the hilltop village of Gordes, Apt, Roussillion and the Lubéron Valley. The smell of fresh-crushed grapes and the excitement of the harvest in September. Our manor house in Avignon – your perfect home in Provence for experiencing the above!! 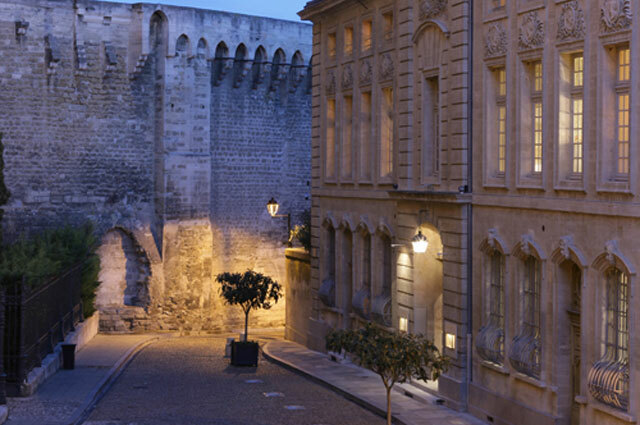 When you exit the Palace of the Popes, dazzled and seduced, you will find across the street Avignon’s grandest, most graciously gorgeous hotel: a 17th-century facade on a 14th-century cardinal’s residence that couldn’t have been better appointed. Located in a tranquil cobbled square at the foot of the Palace of the Popes, protected from the noise and bustle of the town, the hotel offers an unforgettable elegance of its historic interiors, a secluded garden and terraces, and the quality of life of former times. 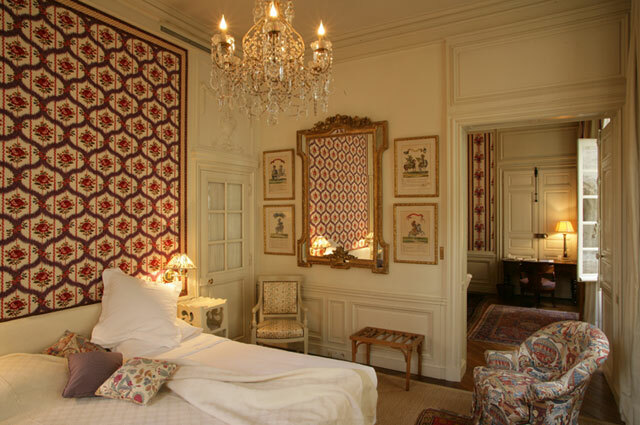 Twenty exquisite rooms are designed by a well-know Parisian interior designer and furnished with the finest antiques, offering a spectacular journey into the most impressive chapters of the history of French decorative arts. And..the restaurant is one of the region’s top tables. It serves traditional Provençal cuisine at its best: breakfasts in particular are très délicieux. Make sure to tear your eyes away from your food and gaze up at the dining room’s impressive original ceiling. Afternoon tea is served every day, complete with handmade pastries, in the glass-roofed patio. Dinner in the hotel’s basement kitchen is a must for gourmets. 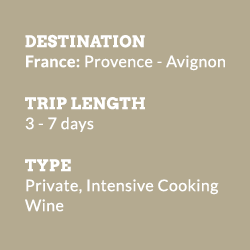 Cooking courses and private wine tours to Chateauneuf du Pape are offered year-round, except for July & August. In February we offer special truffle weekends. Please let us know your preferred dates and we will tailor-make an itinerary for you. Non-participating partners are welcome to join for lunch or dinner at an additional fee. Partners of participants are welcome to stay at a reduced price. Travel to and from hotel. Optional meals not listed. Closest airport is Marseilles. Closest TGV train station is Avignon. 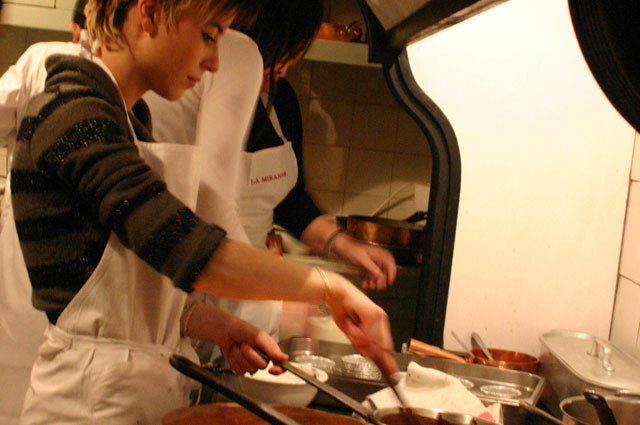 The cooking courses and hotel are centrally located for exploring the walled city on foot. 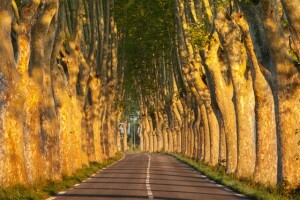 For excursions into the Provence countryside, we recommend hiring a car. 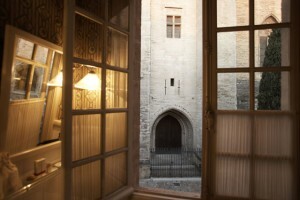 Arrive in Avignon and check into your beautiful room overlooking the Palais de Pape. Take a stroll through the beautiful city and take an aperitif on a leafy square. Savour dinner in one of the many wonderful bistros or gourmet restaurants of the city. We will be glad to make a booking for you. Enjoy a scrumptious breakfast on our patio, overlooking the Palais de Pape. Visit of the Avignon central market, where you will choose your menu according to the seasonal products with the advice of our chef. Discover through smells, tastes, colours which of the delicious Provencal ingredients to buy. Return to the hotel’s authentic 19th century kitchen for a practical «hands-on» experience, working around a huge wood-block table. 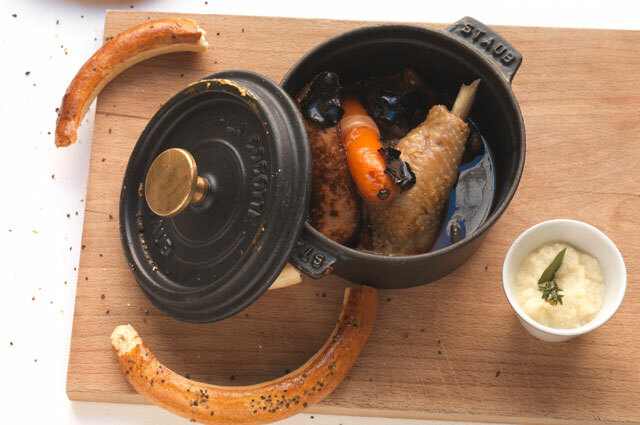 For lunch, savour your own French creations. The afternoon is at leisure. Visit the famous “Pont d’Avignon”, explore the hilltop village of Gordes, Apt, Roussillion and the Lubéron Valley, drive through lavender fields to the 12th- century Abbey of Sénanqueor, or further explore Back in Avignon, enjoy an aperitif on our terrace, followed by dinner in one of the many bistros or Michelin-starred restaurants of the region. Tuck into crisp sheets of your elegant room, dreaming of a perfect day in Provence. After a scrumptious breakfast, take a second cooking course, OR, let us guide you to Châteauneuf-du-Pape to taste some of the finest wines in the world. Experience its wide array of aromas and flavours that remind of a Provençal marketplace while its texture—rich and round, sumptuous and opulent—is virtually unmatched by most of the wines of the world. 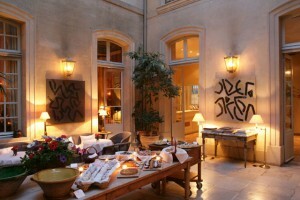 Departure after breakfast or extend your stay in Provence. Au revoir and a bientot! ” I had a marvelous time in Avignon!! Thank you! The hotel was wonderful – quite special! The Cooking School – fabulous!! Everything was super – I had a splendid time! 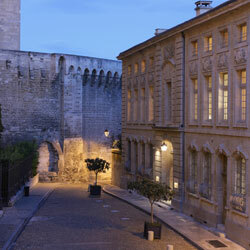 Avignon is a beautiful town and the hotel and cooking school – two gorgeous gems – right there.! “ Avignon was lovely and the hotel was fantastic. Both cooking courses were good. The one with Julien was a lot of fun. It was a completely different experience from the second one. Julien’s class was very casual and very convenient to walk around to get the ingredients and return to his area. In a way it was like we were both students learning, and kitchen staff in a professional kitchen! It was all entirely enjoyable and I felt like I learned a lot in a very practical way. But the 2nd course was really something else. It was partly the setting — the house is really stunning, and the cooking course location in the basement, when you go down the dark and windy stone steps to this massive, gorgeous dining room and kitchen with a high ceiling, is totally unexpected and mind- blowing. It was gorgeous. But it didn’t stop there, when we had done most of the food preparation, we were taken further underground, into the wine cellar for a wine-tasting and a little explanation of the region’s wines. It was absolutely amazing down there. Saverine, was so very generous with me. She was energetic, attentive, and made everything really fun. For most of the time, she did a simultaneous translation, as the chef didn’t really speak any English, and my French is not really good enough to understand him. I felt really local and it added to my French experience! I learned a lot about French technique, and felt very privileged to have been taught by that chef who even has a Michelin star. He seemed very kind and generous and pleasant and social with the group. The food was absolutely delicious.